After a busy time reuniting with The Beach Boys for their fiftieth anniversary, Brian Wilson was more than ready to get back to his solo career. His latest solo album "No Pier Pressure" has been two years in the making and features guest spot by some of his fellow Beach Boys, as well as She & Him, fun. 's Nate Ruess and Kacey Musgraves. The new album will be available April 7th as a regular 13-track CD, a 16-track deluxe edition CD and a 2-LP 180-gram vinyl. The sixteen song deluxe edition begins with the short wonderful harmonizing of "This Beautiful Day," before diving into the electronic pop/dance beats of "Runaway Dancer," which features help from Sebu Simonian of the band Capital Cities. Wilson slows the tempo down for the classic Beach Boys' sound of "What Ever Happened," which gets a boost from fellow bandmates Al Jardine and David Marks. The bossa nova feel of "On The Island" is perfectly accented by the vocals of She & Him's Zooey Deschanel, while Kacey Musgraves adds a county tinge to "Guess You Had To Be There." The three bonus tracks on the deluxe edition get tucked away in the middle of the album, with the best of them being "Somewhere Quiet," that features Wilson's iconic harmonizing. The light, care-free sound of "Sail Away" shows the wonderful warmth in the vocals between Wilson, Al Jardine and Blondie Chaplin. The album closes with the gentle touch of piano for "The Last Song" as Wilson's voice is allowed to shine one more time. 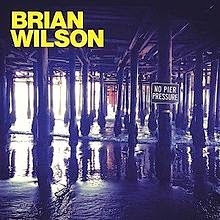 At 72 years of age, Brian Wilson shows no signs of slowing down as he follows the release of his new album "No Pier Pressure" with a two month summer tour of the U.S. To find out more, please visit brianwilson.com.